The cost of ensuring adequate available generation in the nation's largest power market surged as power plant operators raised offer prices to offset lower energy revenues and fewer new natural gas plants coming online. PJM Interconnection yesterday said clearing prices for capacity across much of its 13-state footprint nearly doubled to $140 per megawatt-day (MWd) from $76.53 last year. The increase means consumers in the Mid-Atlantic and Midwest will pay about $2.3 billion a year in additional costs to keep air conditioners running in 2021-22. Pockets within PJM will see even higher prices because of transmission constraints. In areas served by Baltimore Gas & Electric Co. and by Commonwealth Edison in the Chicago area, and for Public Service Electric and Gas Co.'s New Jersey service areas, prices range from $195 to $205 per MWd. Grid operator PJM procures capacity each spring on behalf of utilities three years in advance of when it's needed. The lead time is meant to provide time to build or upgrade power plants if needed. Price movements are seen as an indicator of oversupply or the need for new investment. Rising prices generally indicate a tightening market, while lower prices suggest that a larger supply cushion exists. The auction results are watched closely, but especially this year amid proposals to reform PJM's capacity market and as the Department of Energy continues to weigh a request by bankrupt FirstEnergy Solutions Corp. to rescue money-losing coal and nuclear plants. This year's jump in clearing prices came as a surprise for many analysts who were expecting only a slight increase in prices. Stu Bresler, PJM's senior vice president of operations and markets, said a key reason for the increase was the continued decline of energy prices, which affected the auction in a couple of ways. Generators, for instance, raised offer prices in response to lower realized and expected energy revenues, he said. While the higher capacity costs offset the benefit of lower energy prices, the trade-off can be viewed "as a bit of an insurance policy for end-use customers," who can be sure there will be ample generation available when it's needed, Bresler said. This year's auction attracted less new capacity than in years past as the wave of new combined-cycle natural gas plants entering the PJM market slowed down. Overall, about 1,400 megawatts of new generation cleared the auction, compared with more than 5,000 MW of new gas generation two years ago. "New generators held back entering PJM this year, which drove up capacity auction," said Toby Shea, a vice president at Moody's Investors Service, who said the higher prices benefited all independent power producers. 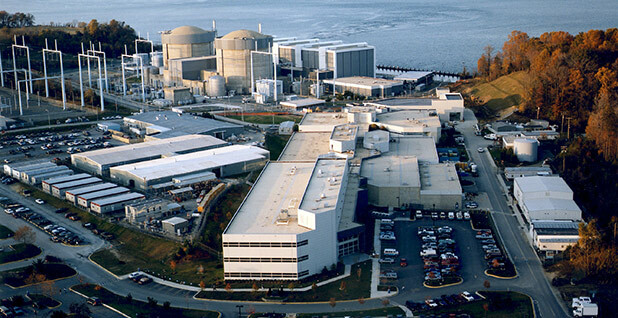 The higher prices, however, didn't help many nuclear operators across PJM, where 7,400 MW of nuclear generation — more than one-fourth of the nuclear capacity that cleared a year ago — failed to make the cut. PJM officials wouldn't name which specific units or plants didn't clear the auction, but it's anticipated the list includes the three FirstEnergy Solutions nuclear plants in Ohio and Pennsylvania, representing more than 4,000 MW of capacity, that are slated to close in 2020 and 2021 (Energywire, April 2). Bresler said FirstEnergy Solutions was required to offer its nuclear plants in the auction unless the company either notified PJM ahead of a September deadline to be exempt or received a waiver from the Federal Energy Regulatory Commission. The void from the sharp decrease in nuclear capacity was partially filled with an increase in existing natural gas-fired generation as well as a 500-MW increase in coal generation, prompting immediate concerns about the climate implications of the increased reliance on fossil fuels. Significantly higher levels of wind and solar capacity, energy efficiency and demand response — when end-users commit to voluntarily reduce their electricity usage during periods of peak demand — also cleared the auction. PJM said 11,126 MW of demand response cleared, 2,832 MW of energy efficiency, 1,417 MW of wind and 527 MW of solar. While some of the renewable and demand-side resources were aggregated seasonal resources, much of the demand response was offered on a year-round basis, meaning it's committed to be available when called. Environmental advocates have urged the grid operator to change the auction rules to allow resources to bid into the market on a seasonal basis to increase participation by clean energy resources. Bresler said yesterday that he was "a little surprised" by the amount of year-round demand response that cleared and said the market response might deem the issue moot. "I have to sit back and question whether we have an issue there," he said. Jennifer Chen, an attorney for NRDC's Sustainable FERC Project, said the increases in demand response and renewable resources shouldn't be taken as a signal that PJM's capacity market design doesn't need changes. "Seasonal resources should be increasing as technology and innovation drive down prices," she said. Chen said a two-season capacity market, as proposed during a recent FERC technical conference on the topic, would allow more wind, solar and demand response to participate. "It would enable even more of these resources to participate at an even lower price," she said. Overall, the 163,627 MW of capacity that cleared this year's auction represents a reserve margin of 21.5 percent, which exceeds PJM's required reserve margin of 15.8 percent. The 2021-22 auction conducted this month is the second year in which all capacity is subject to phased-in performance standards approved by federal regulators in 2015. The so-called capacity performance standards mostly stem from the 2014 polar vortex, when some generators failed or could not get fuel. The rules establish penalties for units that fail to run when needed. Owners of the most reliable units can earn bonuses. Correction: PJM misstated the amount of energy efficiency megawatts cleared in the PJM auction in its press release yesterday. The correct amount is 2,832 MW of energy efficiency.